I recently got interested in vegan (eggless and dairy free) pastry. After my several unsuccessful attempts on this, banana upside down mini cakes finally worked perfectly. They came out really flavorful and full of aroma, airy, tender and moist at the same time. I had a great breakfast. So for the first time since these experiments started I really feel like sharing a recipe. That's not because I’m going to become a vegan. I'm not pretending I I’m at least a bit logical here either. Just when I’m working I often get nervous. When I’m nervous I eat sweets. That’s why I was eating way too much chocolate chip cookies, carrot cakes, brownies, almond croissants and cinnabons these last couple of weeks. So now I really feel like something lighter and more friendly to my body. It still has to be sweet though. This is how I ended up trying to figure out how the vegan pastry works last weekend. I didn't really realize before that smart people have learned to bake without eggs, butter etc long ago. I was struggling for quite some time with the substitution rules. Then I started trying to bake cookies and cupcakes. The first 3 attempts (oatmeal cookies, pumpkin cupcakes and banana upside down cake) came out far from perfect. Things were not rising, or rising and then falling back down, coming out too dry etc. 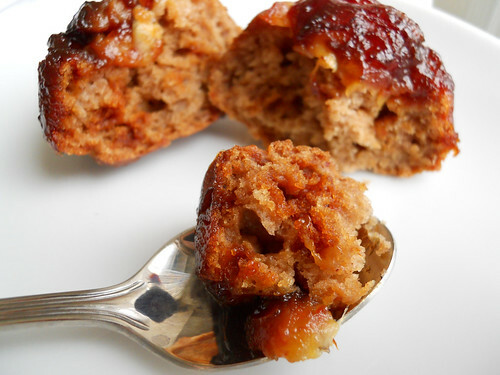 I already started loosing hope when these banana upside down mini cakes came out so good. They are also quite simple to make by the way. First, make the caramel for the topping. If you don't like to bother with caramel, just use the dark brown sugar instead. I personally prefer to make the caramel as it has its special slight bitterness. Slightly brush 6 cupcake / muffin baking dish with vegetable oil. In a small heavy base pan combine the 30 g sugar for the topping with some water (enough to get the sugar wet). Set the pan over high heat, bring to boil. Boil until the syrup thickens and turns golden. Cook a bit more, to get dark brown color. More pictures on how to make the caramel are here, in the tarte tatin recipe. When done, pour the caramel into the baking cups (if using the steel baking dish). If you are using a silicon baking dish, the hot caramel will kill it, so pour the caramel onto a piece of foil slightly brushed with oil. Let it cool for 10 minutes, then break it into pieces and powder in a blender. Pour the powder in the silicon baking cups. Slice half the banana to get 6 pretty round slices around 7 mm thick and place them on top of the caramel. Slightly drizzle with lemon juice. For the cake mash the bananas together with apple. Add the oil and vanilla and mix well. In a medium bowl combine all the dry ingredients and mix well. Pour the banana mixture in and mix till combined. Try to make it rather fast (the baking powder instantly starts working, so it is better to start baking asap). Pour the butter into the baking dish on top of the caramel and bananas. Stick the dish into the 180C oven and bake for 35 minutes. The ready mini cakes should fill set on top and spongy if you press. Take them out and let cool for 20 minutes. Then flip the dish over and take the cakes out. If the bananas stick to the dish, just help them a bit with a knife. These cakes were perfect on their own while still warm, with a cup of tea. Alternatively, add some vanilla sauce or a scoop of ice-cream and enjoy.